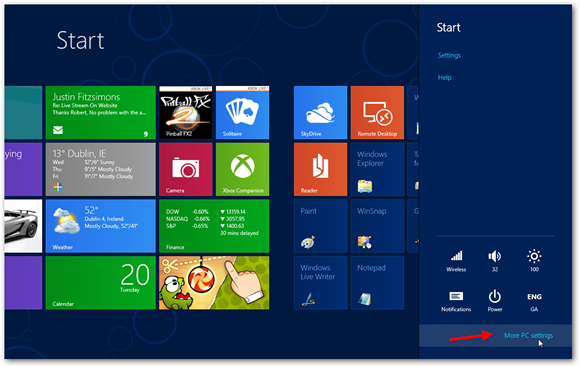 Two of the new features that can be found in Windows 8 are “Refresh” and “Reset”. These are two great new features which will quickly and easily allow you to get your Windows 8 PC running like new in no time if you start having issues with it. In the past, if you wanted to reset your computer to its factory settings you would have to manually perform a complete clean install which was too difficult for the average user. What’s more, you also lost all of your files and data. In Windows 8 this isn’t necessarily the case anymore. 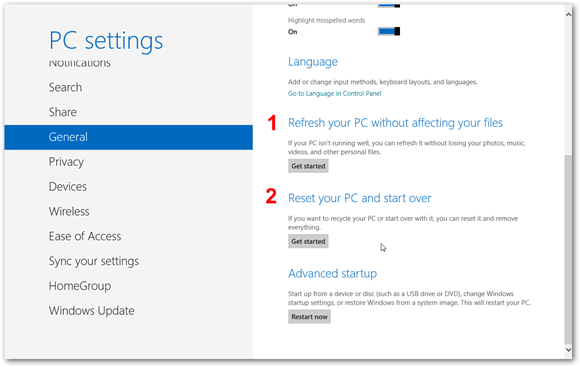 Of course, the first step in troubleshooting your PC is to perform a System Restore which will restore your computer’s settings back to the same state as they were when you last knew they were working. However, if this still doesn’t work, then you should look into using the Refresh and Reset features. When you refresh your PC, Windows 8 is essentially installing a completely fresh new copy of the operating system, but it automatically restores your data and settings for you. This means that you don’t even have to worry about backing up your data to an external drive and then manually restoring it. Once you’ve clicked that click on More PC settings. Windows will now present you with a description of what exactly refreshing your PC is going to do. When you’re ready to do it simply click Next, go grab a cup of tea and when you come back you should have a nice refreshed copy of Windows 8. Resetting your PC is a more drastic measure to take if performing a System Restore or System Refresh hasn’t solved your issue. 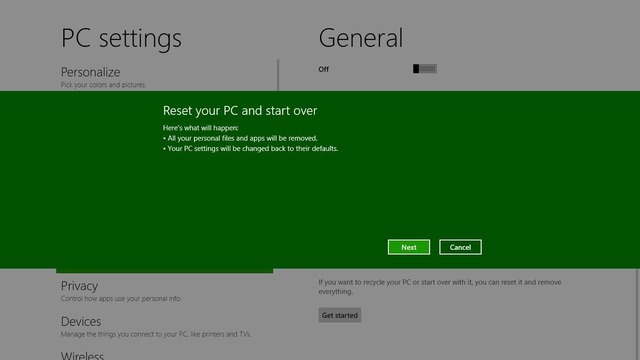 A system reset is also a good idea however if you plan on selling your PC as it completely wipes it clean and restores it to the original state you bought it in. All your data will be removed along with your settings and programs. If you want to reset your PC, it’s important that you back up your important files and data so you can copy them back over afterward. 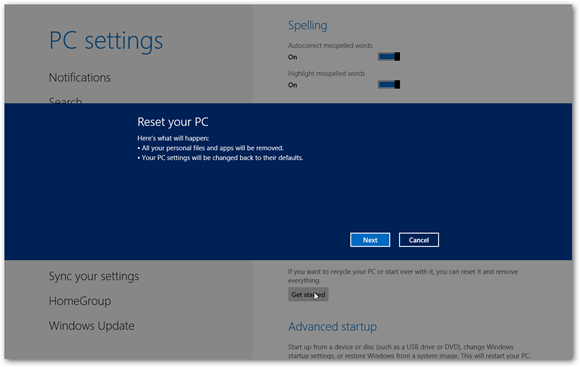 Once you click next, Windows will ask you what kind of reset you want to perform. The first choice is a lot more thorough and can take a long time to carry out but it is highly recommended that you choose this option if you are selling on your PC. The second option is quicker but your files might still be recoverable if someone uses the right tools to recover them. 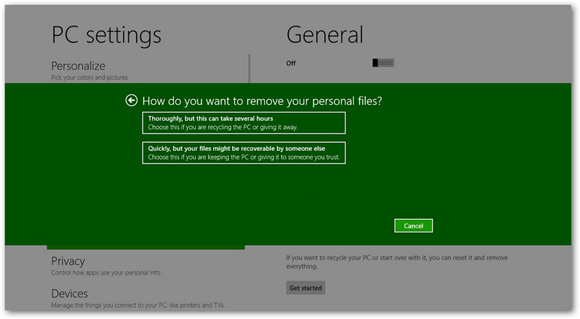 Once you’ve chosen how you want to remove your personal files, just sit back and let Windows do its thing. Once it’s done you will have a completely clean copy of Windows 8 on your PC. 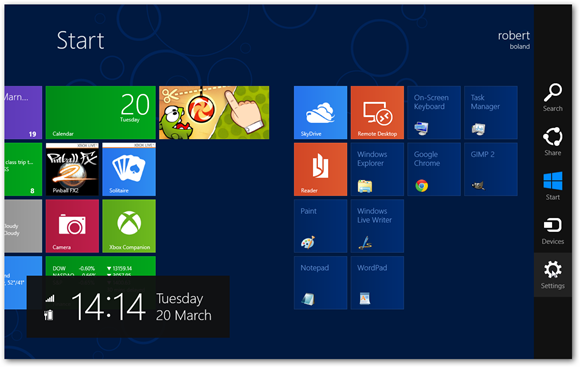 These new recovery options in Windows 8 will certainly make life much easier for the general consumer. I recommend that if anyone’s having issues with Windows 8 that they first perform a System Restore, failing that they should Refresh their PC and if all else fails then resort to Resetting your PC.